Last week, at least 8,000 barrels of crude oil gushed into the northern Amazon rainforest in Peru, creating one of the worst spills the region has seen in years. State oil company Petroperú is blaming a local indigenous community for sabotaging a pipeline and triggering the spill, but the leader of Peru’s Wampis Nation, whose members make up that community, denies the accusations. Petroperú confirmed the damage to the Norperuano pipeline on November 27. The company shared a press release with Earther containing a hand-written letter it says it received November 20, in which three individuals threaten to damage the pipeline if the company didn’t declare recent election results invalid (although the company is not in charge of elections). The writers are claiming corruption and fraud within a local mayoral election that was won by the National Restoration Party, which is associated with Christian fundamentalism. The letter writers identify as indigenous peoples of Morona, the district containing the Wampis community of Mayuriaga, which sits about 500 yards from the spill site. In a separate statement shared with Earther, the company said that 20 of its employees were held hostage from November 17 to 20, a practice this community has been accused of before. After a Petroperu oil spill 2016, it was widely reported that Mayuriaga community members seized a grounded military helicopter and took eight officials hostage for a night to demand inclusion in an emergency response plan. The company didn’t provide details on how exactly it discovered the damage. It simply alleged that vandals cut the line and oil was spilled, something that has been confirmed through aerial surveys. Nearly week later, officials with the company still hadn’t been able to assess the site and do clean up work, spokesperson Juan Jose Beteta Herrera told Earther on Monday. The company said the community wouldn’t allow them to enter the area safely. Wrays Perez, president of the Territorial Autonomous Government of the Wampis Nation, categorically denied the allegation that members of the Mayuriaga community were behind the spill, telling Earther contaminating the land is not in his peoples’ interests. When asked about the hand-written letter, he said it had been “manipulated” and that the company chose names to attach. He didn’t elaborate further. An aerial image of the spill that occurred November 27, 2018. Perez also denied allegations that the community wouldn’t let in Petroperu cleanup crews, and that his people had held Petroperu workers hostage recently. Regarding the 2016 incident, Perez says it didn’t go down the way it was reported in the press. According to him, officials from Petroperu simply chose to spend an additional night in the Amazon. “No one held them back. They stayed because it got late,” he said. Perez emphasized that rupturing a pipeline would only exacerbate the environmental damage his people have seen. Oil spills are sadly common in the Amazon—especially in the Loreto region in the northernmost part of the Peru, which includes Morona, the district where Mayuriaga is located. The Wampis Nation has come out against oil extraction in the region in the past. Hernán Arturo Manrique López, a researcher at Leuven University in Belgium, has been compiling data on Peru’s oil spills for his masters’ thesis. He says this latest one is the largest seen in a decade. Between 2011 and 2018, he’s determined that 102 spills have occurred in Loreto, amounting to 57 percent of the spills across all of Peru during that same time period. Many of these spills were dozens or hundreds of barrels, but there have been instances where thousands of barrels spilled. Before last week’s incident, the largest recent spill was in 2014, and unleashed 3,000 barrels into the Loreto province. While the cause of most spills historically has been corrosion, per Manrique López’s data, that 2014 spill was also attributed to a third party disruptor. ,” Manrique López told Earther. To him, it didn’t make sense why members of local indigenous communities, who claim to be fighting for their land rights and protection of natural resources, would take an extreme action that would ruin said resources. According to an analysis Petroperú has conducted and shared with Earther, the company has been responsible for 109 oil spills over the last 41 years. The company attributes 69 of these spills to third-parties, which they describe as vandalism. However, these discussions are quickly escalating to full-on disputes. Petroperú told Earther it believes that since every oil spill requires a cleanup, a small group of people who want to find cleanup work cause spills. The company has filed a complaint against the three individuals who signed the letter it shared with Earther, according to a November 30 statement it released in Spanish. It’s also filed another three complaints regarding last week’s alleged vandalism, the alleged 2016 hostage situation, and another past threat. These complaints are all recent and don’t appear to have gone to court just yet. Perez doesn’t believe his people are behind this recent spill or the other incidents Petroperú has filed complaints over. If anything, he suggested that the pipeline’s old age might’ve been at fault. The pipeline is in need of maintenance due to its age, Andrew Miller, advocacy director with Amazon Watch, told Earther. Perez said that a governmental commission is now in Mayuriaga to investigate the matter. Samuel Sumpa, an indigenous member of the Wampis who lives in Mayuriaga, told Earther he doesn’t know what happened, so he can’t speak about it. He is very worried, however. “Even a clean up won’t leave the land the way God intended it to be,” Sumpa said in Spanish. Another aerial view of the spill site, which appears to be entering a river. Indeed, we know is that a spill like this poses a major threat to people and the environment. Amnesty International laid out the ways ingesting the chemicals and toxic metals from oil spills can impact the human body in a 2017 report. People can develop skin lesions, cramps, and even lose their eyesight and suffer miscarriages when exposed to these pollutants. The global human rights organization visited communities like Cuninico, in the Loreto region. This community witnessed a separate oil spill in 2014 from Petroperú, where more than 2,000 barrels of oil expelled near Cuninico Creek, which feeds into the Marañón River. That’s where community members bathe and fish. Amnesty International recorded instances where children were found with elevated blood lead levels and were unable to leave their homes due to body pains and sensitive eyes. 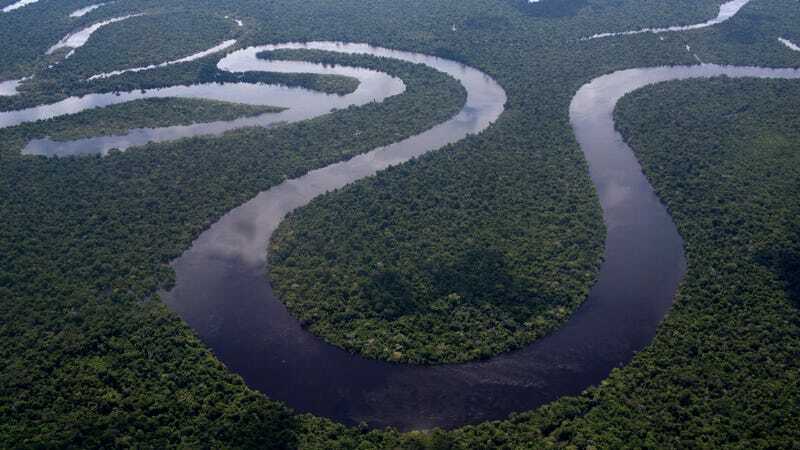 Rainstorms, which are constant in a rainforest, help spread oil from these events far and wide, explained Victor Chama, a tropical ecologist who’s done work with the Amazon Forest Inventory Network. That’s why he wants to see a clean up begin immediately for this recent spill. The heat multiplies impacts, because evaporation of the oil worsens the smell, posing another health risk to locals. In an ideal world, the Amazon would be free of oil infrastructure and wouldn’t have to deal with any of this. Chama would love to see that happen, but he knows such a future is not realistic at the present moment.